A band of brothers in our daily walk with Christ. 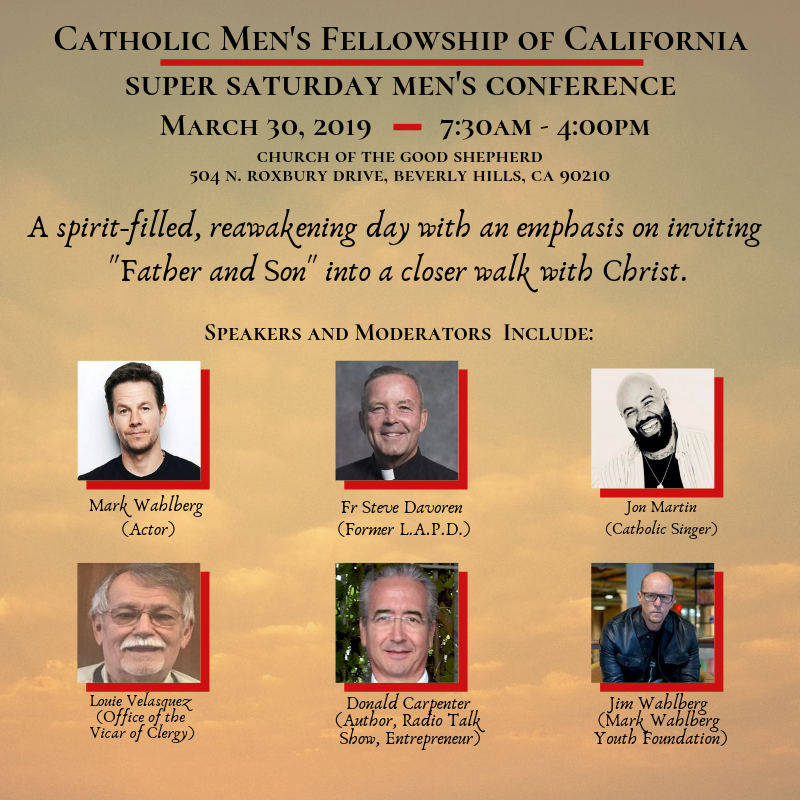 Catholic Men’s Fellowship of California (CMF) is a nation-wide lay ministry, fully approved by the Church, which reaches out to Catholic men and men of all faiths. Its members act to encourage one another to strengthen faith in Christ and to become better sons, brothers, husbands, fathers and friends. Members meet twice per month to support one another, energize their belief, and to build Christ-centered friendships. Catholic Christian Faith is at the center of all activities of the CMF. This video shares information from the California CMF which the Good Shepherd Chapter participates. Click here to download audio of CMF Coordinator Donald Carpenter speaking during our weekend Masses regarding the impact of CMF. Take away from last meeting: All our work is noble and sacred! So give it everything you've got offering it all up to God! Click HERE for a PDF of the notes on "The Gospel of Work". Christ is present as He joins man and woman together.Christ is present as man and woman become one in the trinity of God. Christ is present in the sacrifice both of the Eucharist and of the self as we lay down our lives everyday for one another. St. Teresa of Avila we are his eyes hands and feet for each other. Men and Women submit to one another and sacrifice their lives to one another as Christ did for His Church. We discussed the 7 Sacraments of the Catholic Church. Christ is present in the 7 Sacraments. The 7 Sacraments call us to a holy/sacred life. Christ in the 7 Sacraments binds us to God and to each other. As a Church, as a Fellowship, and most importantly to our Families. The 7 Sacraments empower us to lay down our lives for one another as Christ lays down His life for His Church - Catechism 1088: To accomplish so great a work" - the dispensation or communication of His work of salvation" Christ is always present in His Church, especially in her liturgical celebrations. He is present in the Sacrifice of the Mass not only in the person of His minister, 'the same now offering, through the ministry of priests, who formerly offered Himself on the cross,' but especially in the Eucharistic species. And we prayed . . . we prayed The Glorious Mystery of the Resurrection of the Rosary. Fr. Ed explained the origin of devotion to Divine Mercy and Saint Maria Faustina and we prayed a decade of the Divine Mercy Chaplet. In closing, we prayed for the intentions of each and every man present.